Fulfill wishes? We can do that. “Those were his exact words,” an emotional Macomb Township resident Michelle Burford told WXYZ-TV news in February. Michelle’s husband of 40 years passed away recently after a battle with lung cancer. 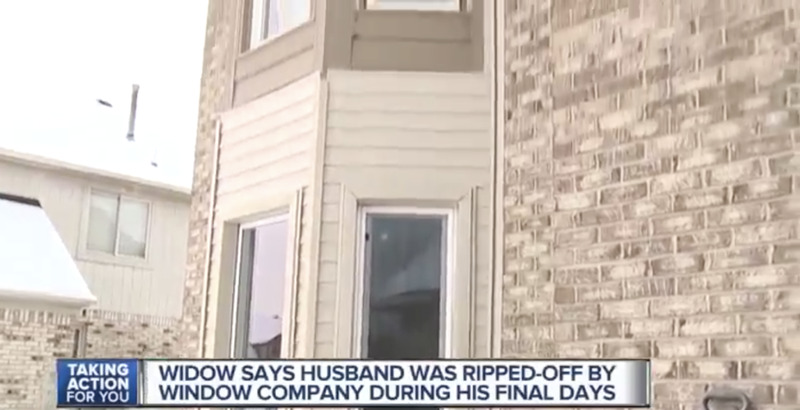 Getting new windows installed at their Macomb Township home was the last thing he hoped to see done, ensuring the safety of his family. The Burfords hired a contractor who they say took $8,000 but didn’t finish the job. “They took from a dying man,” she said. Angry and hurt, Michelle took to Facebook with her concerns. Though the contractor offered to pay back her family the amount owed in installments, it wouldn’t solve the issue. Wallside Windows stepped in to help when a local family was left with a half-finished window replacement, while coping with a death. That’s when Wallside Windows sprang into action to complete the job. Wallside’s Stanford Blanck happened to be watching the news and heard Michelle’s story. He contacted WXYZ-TV and the station connected Michelle with Stanford. Earlier this week, on March 14, two work crews were sent to the Burford’s house, spending the whole day sealing up the windows and correcting any work that was done improperly or left unfinished. Wallside prides itself on its customer service and helping a grieving widow and was just part of the job. A “very emotional” Michelle expressed relief after the harrowing experience in another news report this week. Wallside Windows aids a Macomb Township family in need of windows, as WXYZ-TV reports. How can we help you and your family? Call Wallside Windows today for your free estimate.